The recent development of Long Island City, particularly Hunters Point, has been the most dramatic shift in a Queens neighborhood in at least the past 20 years. The Citibank Tower's visual omnipresence over the previously low-rise neighborhood is only being challenged lately by the scrum of condo towers rising on the East River waterfront. Vernon Boulevard has grown quickly through the 2000s, adding upscale restaurants and reviving at least some of the existing neighborhood classics. It's the main street for the new and old Long Island City. With popularity has come many more complaints about noise from late-night bars. A sleepy neighborhood has awoken with thousands of new neighbors with more on the way. The man-made beach in Hunters Point has gained a lot of press for the neighborhood since its mid-2000s opening. Pair the beach with PS 1's Warm-Up parties and you have one of the hippest summer spots in the city. Despite promises from politicians and recent condominium developments, Queens Plaza remains a mess, a place best avoided at night or alone. The above-ground subway and the Queensboro Bridge traffic conspire to create an iron canopy, rusting above a slick of donut shops and strip clubs. In the Ravenswood neighborhood of Long Island City, the arts have taken hold. The small, but intense Noguchi Museum is a must-see for lovers of the modernist sculptor's work. The museum is across the street from the Socrates Sculpture Park, making the two a good combo, but neither is close to the subway or much else. North of Queens Plaza and west (and south) of Astoria, Ravenswood is a forgotten corner of Long Island City. Home to industry and large public housing, the area is relatively safe, but less accessible by public transportation than Astoria or Dutch Kills. The borough-wide building and teardown boom has come to Ravenswood, but not at the same pace as nearby Astoria. The pictured houses shows a couple layers of New York City history. It's humble, but it's got heart. NOTE: Macy's fireworks are now over the Hudson River, not the East River, and are therefore far from Long Island City. Long Island City's premier fireworks-watching venue was Gantry Plaza State Park. It used to be a great view with less hassle than Manhattan. The beautiful old firehouse on the TV series Third Watch was the real-life home of FDNY Engine 258/Ladder 115, an active firehouse on 47th Avenue in Long Island City, Queens. Many of the Third Watch extras were active FDNY firefighters. It might surprise many that Sunnyside is part of Long Island City. It's one of the original neighborhoods that comprised the once independent city. 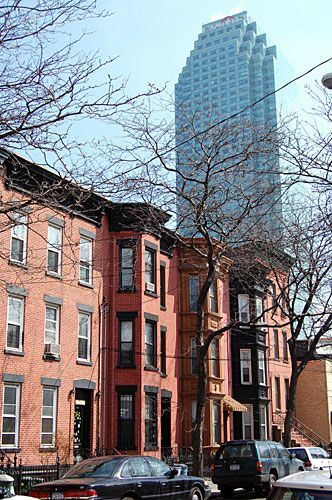 This quiet residential neighborhood is separated from the LIC's industry and now condo towers by the Sunnyside Rail Yards. What a contrast in building styles! The three buildings serve a common residential purpose, but little in style. Forgotten in all the press and excitement about Long Island City's new condo towers are the numerous teardowns and smaller new buildings throughout the area. The middle building in the photo is a smaller apartment building that went up in the past few years in Hunters Point. Astoria is another neighborhood of Long Island City, but like Sunnyside, it has its own identity. Even some residents raise an eyebrow when told the neighborhood is actually Long Island City. Meanwhile, as Astoria real estate has climbed sky high, local real estate brokers would like to push the neighborhood's boundaries onto more humble Dutch Kills. Walk out on the pier at Gantry Plaza State Park. The view of Manhattan is first rate with the U.N. directly across the East River. The mid-2000s has seen a spat of condo development in the Hunters Point neighborhood of Long Island City. New construction of condominium towers has transformed a largely industrial area to residential. The Long Island City Courthouse is a landmarked building at Court Square in Queens, New York, across from the Citi Tower. The Long Island City Courthouse is part of the Supreme Court of Queens County (11th Judicial District) in the State of New York. Civil cases are heard at the courthouse, though it used to hold criminal trials. Willie Sutton, the bank robber, was tried at the courthouse, and supposedly it was the site of his most famous quote. In answer to a reporter's question of why did he rob banks, Sutton is credited as saying "because that's where the money is." However, in th book (Where the Money Was: The Memoirs of a Bank Robber), Sutton denied ever saying it. The courthouse is easily accessible from the E, G, V, and 7 subways. The LIRR has limited stops at Hunterspoint Avenue, a longer walk than the subways. Lunch options around the courthouse have improved in the 2000s. Here are a few lunch picks for the nearby P.S. 1 art museum, very close to the courthouse. The Court Square Diner is always a good choice for typical diner food, quick service, and convenience to the jury room.